[SatNews] ..."catapulting the Arab region into a new era of space industry and competition in space sciences,” the news agency reported. The United Arab Emirates plans to launch the first Arab-built satellite into orbit in 2017, according to the state news agency WAM. The ‘Khalifa Sat’ is set to be the fifth satellite owned by the UAE, but the first to be wholly manufactured in the country. “Khalifa Sat will be the first Arab-made satellite, catapulting the Arab region into a new era of space industry and competition in space sciences,” the news agency reported. Sheikh Mohammed bin Rashid al-Maktoum, Vice President and Prime Minister and Ruler of Dubai, launched the “executive phases” of the project yesterday, WAM said. “Khalifa Sat is a message to all Arabs that Arab ushering into the space era is neither out of reach nor impossible,” Sheikh Mohammed said. “Our doors will remain open for cooperation with all Arab countries in space technology and engineering,” he added. The satellite will be built at the Emirates Institution for Advanced Science and Technology (EIAST) in Dubai, according to WAM. EIAST previously launched two satellites, DubaiSat1 and DubaiSat2. 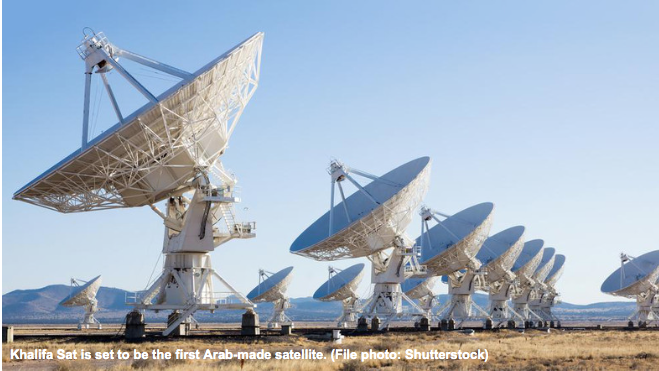 The Abu Dhabi-based Yahsat currently operates two satellites and has previously indicated the possibility of launching a third.